SAN DIEGO, CA (THE WIRE PRESS) – In recognition of the increasing number of employers that have explored the adoption of pet-friendly policies in recent years, Petco today announced the establishment of “National Pets @ Work Day” – a day-long celebration to raise awareness of the mutual benefits of having pets at work. Improve employee health: The presence of animals – even simply viewing fish tanks – can reduce heart rate and blood pressure. In fact, just petting an animal lowers blood pressure and cholesterol. Reduce stress: Research links interactions with animals to positive changes in self-reported anxiety and calmness. Interaction with a companion animal, specifically a dog, also positively affects endocrine responses, including changes in cortisol, epinephrine, norepinephrine and serotonin levels. Increase productivity & promote creativity: Dogs remind us to get up and take breaks throughout the work day, which have been shown to improve employee morale, productivity and focus. Enhance socialization among co-workers: Pets can act as catalysts for human social interactions. In fact, a series of workplace experiments showed employees were more likely to trust each other and collaborate more effectively when dogs were present. Improve productivity: Not having to worry about pets left at home allows employees to focus on and complete work responsibilities without having to rush home to feed or let the dog out. They may also be able to stay and enjoy office lunches, happy hours or other activities they may otherwise miss. Bringing pets to work not only has benefits for employees and their furry (or non-furry) friends, but also for employers. Pets can add to the sense of workplace community, act as a conversation starter and provide comic relief. 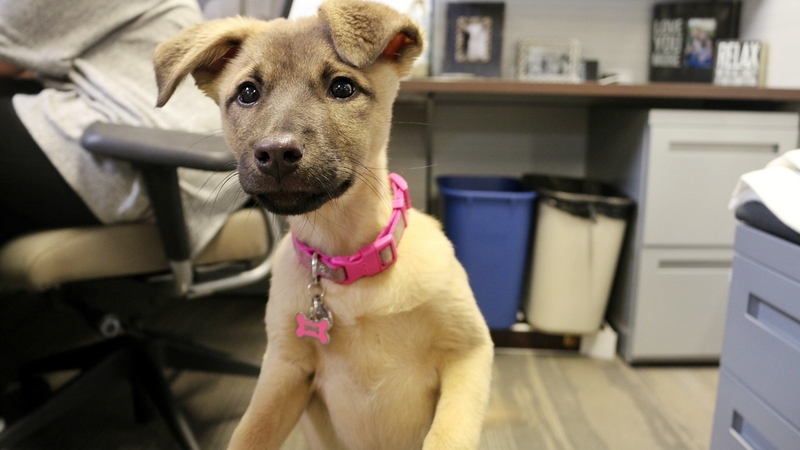 And, a pet-friendly policy can boost team morale, reduce stress and serve as a differentiating employee perk. Petco employees experience the benefits of having pets at work every day. The company’s corporate offices, both in San Diego and San Antonio, have always been pet-friendly; and employees working in the company’s retail stores come into contact with countless pets each day. To kick off Pets @ Work day, Petco will be conducting an Instagram contest to solicit the best photos of pets at work – the top submissions tagged with the #PetsAtWorkDay hashtag will have a chance to win one of five $50 Petco gift cards. Throughout the day, pet parents can also find key factoids on the benefits of having pets at work and resources for those employers considering a pet-friendly office policy across Petco’s Community, Facebook, Twitter and LinkedIn pages, and on Petco’s YouTube channel. Pet parents and their four-legged (or finned, fuzzy or scaly) officemates are invited to join the conversation with the hashtag #PetsAtWorkDay. For more information, visit about.petco.com/pets-at-work. With more than 50 years of service to pet parents, Petco is a leading pet specialty retailer that focuses on nurturing powerful relationships between people and pets. We do this by providing the products, services, advice and experiences that keep pets physically fit, mentally alert, socially engaged and emotionally happy. Everything we do is guided by our vision for Healthier Pets. Happier People. Better World. We operate more than 1,430 Petco locations across the U.S., Mexico and Puerto Rico, including more than 115 Unleashed by Petco locations, a smaller format neighborhood shop; prescription services and pet supplies from the leading veterinary-operated pet product supplier, Drs. Foster & Smith; and petco.com. The Petco Foundation, an independent nonprofit organization, has invested more than $135 million since it was created in 1999 to help promote and improve the welfare of companion animals. In conjunction with the Foundation, we work with and support thousands of local animal welfare groups across the country and, through in-store adoption events, help find homes for more than 400,000 animals every year.